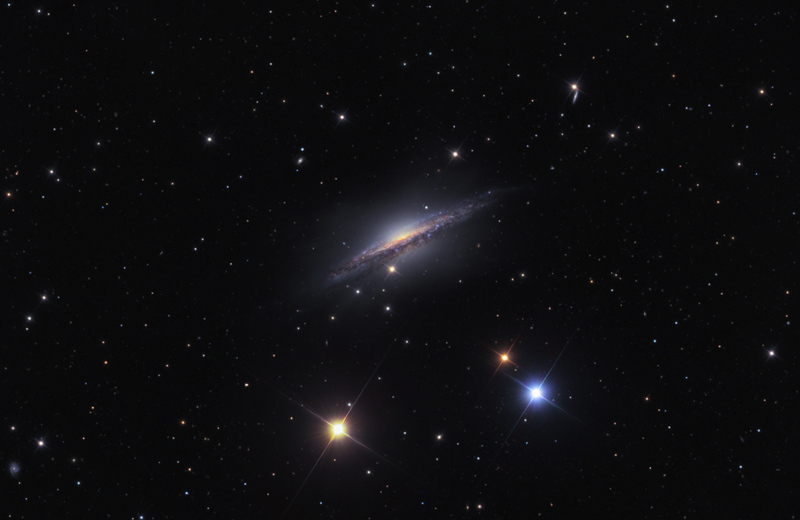 Image Credit & Copyright: Ken Crawford (Rancho Del Sol Obs. ), Collaboration: David Martinez-Delgado (MPIA, IAC), et al. Explanation: Big, beautiful spiral galaxy NGC 1055 is a dominant member of a small galaxy group a mere 60 million light-years away toward the intimidating constellation Cetus. Seen edge-on, the island universe spans about 100,000 light-years, similar in size to our own Milky Way. Colorful, spiky stars in this cosmic portrait of NGC 1055 are in the foreground, well within the Milky Way. But along with a smattering of more distant background galaxies, the deep image also reveals a curious box-shaped inner halo extending far above and below this galaxy's dusty plane. The halo itself is laced with faint, narrow structures, and could represent the mixed and spread out debris from a satellite galaxy disrupted by the larger spiral some 10 billion years ago.